The St. Croix Forge EZ is a front and hind shaped wide web shoe providing additional support of the hoof and limb. 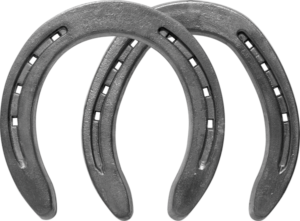 They are available unclipped, with toe or side clips in the front, or with quarter clips in the hind. The wider section of steel and optimal shape allow for easy modification. These shoes are punched for a CH5 nail.